These are great shoes. After suffering from two different Boa failures, I'm through with Boas and am happy to go back to something that works - laces! I love the fact that these shoes come with two different types of insoles. The ones I chose have the removable arch supports. I am using the high arch supports and my feet also appreciate the metatarsal button on the insoles. Longer rides are more comfortable compared to my last shoes. The leather uppers are soft and supple. Shoes are amazingly lightweight. The Empire SLX are light, comfortable, stylish and stiff. Best shoes I've ever worn. Tried the Factor Techlace and they're not even close on comfort. Laces are proving to be a non issue as after a few rides, you get an idea of how tight to tie them. They have never loosened once tied. I have flat feet and have the medium arches in and they are comfortable and supportive. I feel very fast riding in them as they are very light, stiff and minimalist. I came from Sidi Genius and they are big and bulky compared to these. My reason for getting new shoes is that I would get hot spots at the 40 mile mark in the Sidis. Finished a 50 mile ride yesterday in the Empire SLX's and my feet felt great. If comfort is a priority, look no further! My feet are very hard to fit. I usually buy (expensive) shoes that feel good for about five or six weeks, then I start having issues. Giro's policy of - try it out for 60 days, and return them if you are having problems - saved me from having another pair of shoes I could no longer use. And the staff at Western Bike Woks, especially Nate, goes well beyond the defintion of great customer service. I am a loyal fan now. So far my favorite pair of cycling shoes! Comfortable for all day riding! Styling is great and shoes is lightweight, sole is stiff. These cycling shoes are the best. They fit exceptionally well, they are ultra light, and they don't have any technical weaknesses. I race in mine a lot and am the envy of many. Tried the Empire ACC and was impressed with how comfortable they are. 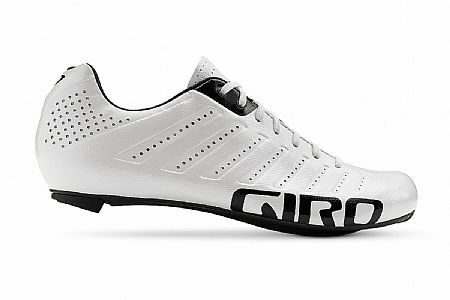 Decided to go for the Empire SLX and Giro has packed a shoe with comfortability, lightweight and a stiff sole. My favorite shoes right now! Toe box is a narrow fit, so wide feet should go a 0.5 size bigger. Huge fan of laces on cycling shoes. The fit and aesthetics afforded by laces are superior to a BOA type system while being lighter and less complicated. Thank you Giro for giving us a simple performance oriented lace-up shoe! Next best thing to barefoot on the beach! I developed plantar fascitis this year and my Sidi Ergo2 and Ergo3 I have enjoyed for years became painful to even put on my feet. I also have a pair of Fizik's that wasn't working either. The Empire SLX has been a gift for my feet! These took a few rides to break in and are now much more comfortable than any bike shoe I have ever worn. And very , very light. My foot is fairly wide and the shoe expands in the toe and forefoot areas to accommodate. I do not miss buckles as the design of this shoe provides give where other shoes caused pressure at the point of the buckle closure on the side of my foot.. I am a 44.5 in Sidi Ergo2 and generally a U.S. mens 10 in most street shoes. These fit me in a 44.5 which is listed as 11 US mens. So I would recommend you order at least a half size larger than what your regular shoe size is. Comfortable Oh yes, unlike anything I've ever used dating back 20 years. My feet just disappear into them. They wrap around my feet with the most uniform pressure I've ever experienced. For lacing i just get them as tight as i can and they loosen up just a bit as I ride. But even when they're a little loose, no change to the comfort. The included arch supports work great. I use the highest of the three. Stiffness oh yeah. Sprint finishes, no problem! Weight I don't know how it matters but it really does seem to. I'm just flat out faster turning over the pedals in these. Intangibles There's a significant stack height difference. These shoes feel REALLY close to the pedals! Perhaps it's really this and not the weight i feel. very lightweight and comfortable shoes. I've had sidi and theses are comparable in size as I wear 43 in both. lace ups make it so it is adjustable in more points. After reading about this product, as well as other reviews, I decided to give them a shot and I'm glad I did. These shoes offer a rigid sole and very light weight. I have not yet ridden them in the heat of summer, so I cannot comment on how cool they will be as the temps go up, but I have very happy with them so far. The laces do cause a bit more time and thought when putting on the shoes versus Velcro andor ratchets, wire, etc., but I think it is well worth it as to how you can get the shoe fit exactly how you want it. I picked these up on sale and couldn't be happier. My old Specialized BOA came completely off and I had been struggling to find a shoe that was as comfortable as those until i took a chance and tried SLXs. First ride was a bit of trial and error on how tight to tie the laces but once thats figured you'll forget you have them on, which is the idea with any new bit of kit. Overall I'm glad I tried these out cases not only do they look sharp (got the bright orange pair) they also fit great. So far, the lightest and most comfortable road shoes I've owned. I've been using these pair with my Speedplay Zero pedals and walkable cleats. Current mileage is 217 miles and my longest ride was 57 miles and it's very comfortable shoes and it's so light. No complaints here. Yes, these shoes are a wonder to behold. Wonderful fit, beautiful construction, super light. Have a chair or stool ready to put them on as the laces do take a little more time to get ready. When they are on sale, the price is ridiculous. However. The size chart is ALL wrong. I wear a 9.5 and the size chart recommends a 43 for that size. I had to get a 44 for proper fit. That is the same size as a Specialized shoe I wear. I don't blame Biretiresdirect for this as this is the same size that Giro recommends from their website. I did tell them about this. For the weight weenies, the 44 weighs 201 gramsshoe. Wow! Light weight and comfortable. Saw these online at a great price. I was a bit skeptical about the laces but was pleasantly surprised when I laced them up and rode 80 miles without them ever feeling loose. These are great, light weight and fit like a pair of your favorite slippers! Love the fit and the weight! I was absolutely amazed when I pulled these out of the box. I had no clue how light they really were. And the lace up fit is so custom and snug. The little elastic strap for the laces is perfect. I've had so many compliments on these shoes and again, the weight and the fit are perfect. Bravo Giro!